The morning nap is usually the first nap to become consistent in a baby’s life. Even though it is not the last nap baby keeps around, it is the most important nap of the day for a new baby. This nap sets the precedent for the rest of the day. This is the nap you want to figure out first. You really can’t get the rest of the naps right until this nap is figured out. Healthy Sleep Habits, Happy Child discusses more reasons this nap is so important. Weissbluth says “…the morning nap has more REM sleep than the afternoon nap; this suggests that in some infants, the morning nap may be viewed as a sort of continuation of night sleep” (page 29). This explains why the first nap of the day is usually quite soon after waking in the morning. For most people, this is very counterintuitive. I remember talking to a friend on the phone one day as I put Brayden down for his morning nap. She was shocked he was going down for a nap and asked what time he got up in the morning. The first waketime of the day is often the shortest waketime of the day. The first nap of the day, if timed right, is usually the longest of the day. It is usually the most reliable for parents. When sleep training, many babies won’t even whimper at this nap if waketime was timed correctly. Even for babies who are ready to drop to one nap a day, the morning nap remains in tact and the child plays through the afternoon nap. It is a reliable nap. Timing the nap is important. For a newborn, this waketime will be the shortest of the day. She might even just wake up, eat, and go back down for a nap. Expect waketime to be 30-45 minutes. It will slowly increase over time. The rate of the increase varies from child to child. By 4 months, your child will usually be up to at least an hour. Perhaps a little more. It continues to increase over time. One thing to note, if your baby is on the younger side when going to a four hour schedule, the morning waketime will not necessarily be two hours followed by a two hour nap. It could be as much as 1 hour waketime and a 3 hour nap or a 1.5 hour waketime and a 2 hour nap. For help on optimal waketime length, see the optimal waketime blog label. Previous Post Poll Results: IF BABY HAD COLIC, ABOUT WHAT AGE DID IT GO AWAY? This makes me feel better- I think my little guy may be switching to one nap, so I've been trying to push the morning nap later, but he won't have it. I guess it's ok to keep the morning nap around the same time and just skip the afternoon one. Good to know! I have a 3 month old. She sleeps well from 8:30pm to 5:30am, she wakes up and I feed her. Then she sleeps until about 8-8:30. I can't get her to nap well during the day. She sleeps about 30-45 minutes for her naps until late afternoon and then she is sleeping from about 4 or 5 to about 7 or 8. Any suggestions on helping her sleep longer during naptime. I am so glad I read this post today. I have a 7 week old and her first nap is usually awesome, not a peep is made – like you mentioned in your post. However, the rest of her naps for the day are not so great. She can't seem to transition without waking. When she wakes and cries, I have been letting her cry so she can learn to self soothe. She will never really fall back to sleep though and then the rest of the day is really a wash until we get to bedtime. She will sleep 7-8 hours at a time now and I am really pleased with that. I have her on a 3 hour schedule but just recently (today) moved her to 2 1/2. Actually she moved herself because she has been hungry 1/2 an hour earlier every feeding. She won't take any more per feeding, so I have just been feeding her closer together. Her naps though… I don't know what to do about them. She wakes EVERY SINGLE time she naps except for the first nap (and at night). I know she knows how to transition it just seems like she may be up too long during her waketime. She is a very lazy eater though and it takes about 30-40 minutes to take a bottle sometimes. So by the time I feed her, burp her, change her diaper and swaddle her it is about time to put her back down. Then she doesn't have any real wake time. It is more just like I am feeding her and then putting her to sleep and then that goes against babywise. I did not have this issue with my #1 DD. She did the normal crying for 20-25 minutes at the start of each nap and then slept the remainder of the time. Can you help? Suggestions would be awesome. Thanks! I have a 10 week old & we've been doing a great bedtime routine for a while now, just not being totally consistent with actual bedtime. We've now made it about 7:30. Her waketime is 6:30am. She wakes up multiple times in the night (just wakes, not necessarily hungry). Like this am, she last woke up about 5am and I out paci back in to buy time until 630. Should I have her waketime be around 5am and put her back down to sleep?? We set her waketime at 630 as we both work and take her to childcare around 8 or so. Should we change our hours a bit? Anything to help her sleep sounder or longer stretches in the night?? Kerry, I am sorry if I gave that impression in this post. Once it is time for one nap, it should be in the afternoon, not in the morning. The morning nap goes away when you go to one nap. But as you transition, it might start around 11 am or in the 12 am hour, but you will want to move it to eventually start around 1 PM. Jason and Megan, a possible culprit is that waketime length is not right. See the "optimal waketime" label. See also "Naps: Troubleshooting revised and updated" for lots of ideas as to why she might not be napping well. Traveling Turtle,Don't worry about her not doing much for waketime. It isn't against BW because she is awake for the diaper change and burping and everything. It is just the way it is right now. She will get faster at eating over time. Sleep is most important for her right now. Garret'sShe is still quite young. Her night sleep is looking great for her age, it just isn't convenient with your schedule. I would suggest the post "early morning feedings before waketime" for ideas on what to do with this situation. All 3 of mine did this as they got closer to sleeping all the way through the night. I know it is annoying, but it doesn't last forever 🙂 She will make it through before too long. Susanna, definitely do not do one nap a day. I would let her get an extra 30 minutes in the morning nap.But, look closely at what is happening. She is awake for 5 hours in the morning, then you try and put her back down after 1.5 hours for the next interval. It is all very inconsistent for her.Is there any way for you to rearrange your gym time? Maybe go to the gym as soon as she is done eating so you can be home by 8? or put her down for a nap at 8, get her up at 10, feed her, then go to the gym?For a 6 month old, she really should be awake for about 2 hours, then down for about 2 hours, then awake for about two hours, then down for about two hours. Then some will take a third nap and some won't. The third nap would be anywhere from 30 minutes to 2 hours. Please help! I have an almost 7 month old (in a week) and have been doing babywise/baby whisperer since the beginning (meaning I didn't do complete CIO at the very beginning but would pat his back if he was having trouble going to sleep). He has been a pretty easy baby and typically I would just lay him down and within 20 min he would be sleeping and would take good naps. About a month and a half ago he started taking short naps (between 30 min and 70 min). It coincided with a wonder week, so I thought it would pass, but it hasn't and now his schedule is so off and a little different almost every day. I have tried the 15 min earlier nap fix, but 70 min is still his max nap. He is almost always happy when he wakes up (even after only 30 min, but I can see he is tired too). I have tried CIO to get him back to sleep, but even after 45 min or so it almost never works. I have a few questions. 1) any ideas how to help him get back to longer naps? 2) what do I do when he only takes 30 min naps all day? What do you do with feeding if they wake early? If I wait until normal eating time, he is already ready to go back to sleep? And if I feed right away, the day hers more and more off. Honestly, right now every day is different (except wake and bed times). And eventhough he is a pretty happy guy, by evening he is fussy cuz he is so overtired. Fortunately, he has still been sleeping well at night (about 12 hrs). Any advice would be great. Thanks. Laura,1-since he was napping well and stopped, you don't want to be shortening waketime. You want to likely be lengthening. Try adding 5 minutes at a time up to about 15-20 and see if that helps things. 2-See the posts "waketime when they wake early" and "waketime when baby wakes early"
I have a 15 week old baby boy and have been following BW since day 1. He is on a 2 1/2- 3 hour schedule and is sleeping through the night. He goes down around 9:30 pm (usually after showing signs of sleepiness- but not asleep yet and doesn't cry or fuss at all! )and wakes around 5:30/ 6:00 am. After his first morning feeding he goes right back down and falls asleep within minutes. He'll usually sleep for 1 1/2- 2 1/2 hours for the first nap. The rest of the day naps are HORRIBLE! He gets sleepy about 1 1/2 after he eats, but doesn't get really tired 'til 2 hours after (I can usually give him the pacifier and he's fine to make it to 2 hours. We were putting him down at 1 1/2, but he was awake and screaming, so I moved it back to 2 hours). My problem is that he will not go down for any of his naps other than the first nap of the day. I'm talking screaming and flailing his arms all over! I've been working for about 3 weeks now on trying to fix this problem. (Specifically not letting him fall asleep in the bouncy seat or the swing.) I've put him down earlier/ later; let him get really tired in the swing and then move him to the bed; used the sleep sheep, white noise, radio; no music; cry it out; I've tried picking him up and calming him; patting his back… NOTHING has worked. When he was napping before ( when I first cut out the swing/ bouncy seat) it was difficult (crying)and I only got about 45 minute naps from him. I think he is one of those 45 minute nappers, which is fine, but now I'm getting nothing but screaming the whole time and no nap! The very few times that he does fall asleep he will wake up exactly 4 minutes after being put down) and then be up the whole time screaming until his next feeding. I am frustrated and need any advice please! Jessica,It could be the wonder week around that age–it is the worst (see wonder week blog label for more).But it does sound like he is going down too late. 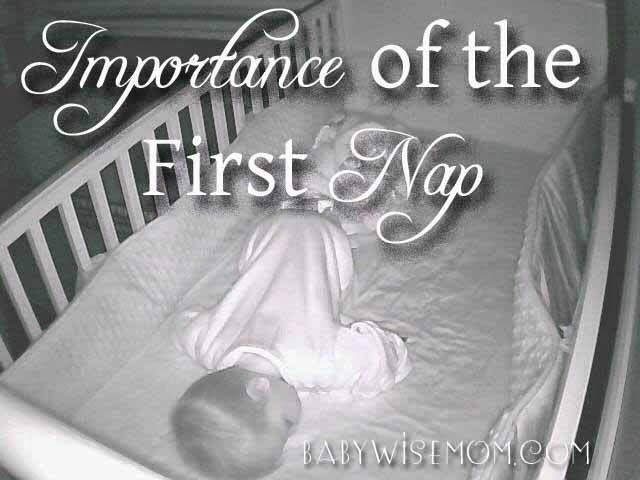 Especially considering that his first waketime is short and that is his only good nap. I would take it all the way back to one hour, then work up from there in 5 minute increments until you find the right number. See the label "optimal waketime" for lots more guidance on this. My son is 6.5 months old. This is our current schedule:7 am wake up, eat (formula and solids) and playtime9 am nap (usually sleeps until 10:30-11)11 am bottle, solids, playtime1 pm nap (lasts anywhere from one hour to 2 1/4 hours)3 pm bottle, solids, play time5 pm nap, but this has almost disappeared7 pm bottle and bedMy problem is that he has started waking up around 6:30 am. He is almost always content to just play in his crib until I come and get him at 7. The problem is with his morning nap. I have been trying to put him down between 8:45 and 9 to stay on schedule but his nap has been only lasting about 45 minutes now. I think it's obvious that he's overtired. His naps are great when he has exactly 2 hours of waketime. When he is waking at 6:30 am what do you suggest I do for his morning nap to still maintain sleep AND schedule? Also, I'd rather not adjust our schedule to begin at 6:30 am, if possible. Charmingly Ordinary, you will have to find a waketime length that works for now. If you can get it right, he quite possibly could sleep longer than two hours to make up for the missed nightime sleep. Good luck! Angie, She most likely will not need waketime if she didn't not nap before. Just let her take a longer nap to make up some of that sleep deficit. So after reading all the comments I don't understand why my 4 week old refuses to take his morning nap. I started BW on day 1 and right now he is on a 3 hour schedule starting at 7am. I have been trying this week to let him CIO but he ends up crying through his entire nap and then of course is overtired and the rest of the naps are horrible. He is sleeping great at night, only getting up once somewhere between 1:30am and 2:30am. Do you have any suggestions on how to get him to nap better for the first nap at 8:30am? Nicole, put him down for his nap somewhere from 7:30-8:00 AM–no later. Good luck! Rachael,I would say school is definitely contributing. I wouldn't do CIO for the nap. For one, I don't to CIO mid-nap for babies that young. for another, considering that she is going down late because of school drdop-off, that will cause her to wake up mid-nap because she went down too late. She will be waking because she is too tired, and she will have a hard time falling back asleep because of it.As she gets older, the time for her to go down will get later. Until then, I would move her to a swing or something when she wakes. You could also look into seeing if someone could watch her while you take your three year old to school. Or you could see if you could carpool so she is disrupted less often. This is my second baby and second time using babywise. She is a 6 week old baby girl who has been on the babywise method since birth. She was doing well but just this week has been causing trouble in the mornings. She sleeps from 6:45pm to 7am (waking about every 4 hours). When she wakes at 7, I nurse her and keep her up until about 7:40am and try to put her down for her nap but she will not sleep. I have let her cry it out, put her in her swing, and rocked her (which I don't want to become habit). I have tried everything and she doesn't want to sleep. Then at 10am she is still awake and I nurse her again and she still won't sleep. She basically stays awake until about 1pm every day without any naps. She isn't overly fussy or anything but she just doesn't want to sleep. I think she is going through a little growth spurt too (she wants to nurse a lot) which may be part of the problem but I don't know what else to do. Natalie, have you tried adding some waketime length? So maybe 45-50 minutes instead? My 9 month old used to nap well (1.5 to 2 hours) in the morning and well in the afternoon (2 to 3 hours). Just recently she's learned to crawl and sit up and when I put her down for her morning nap she just won't go to sleep. There is no CIO option because by the time she gets to sleep, when she sleeps 45 minutes and wakes up it's the normal wake up time.I've increased solids, didn't work. I've moved up the time to nap 15 minutes, didn't work. I've started closing the curtains and doing relaxing things to calm her down before I put her in, doesn't work.She just sits up in the crib and plays (with nothing) and when I come in and tell her to go to sleep and lay her back down, sometimes it works sometimes it doesn't. 9 months is WAY too early to drop a nap, but could it be that she just doesn't need the sleep? This is a totally normal thing to have happen when a child reaches a major milestone like this. I have a post called "nap disruptions: standing, crawling, etc." that can give you ideas of what to do. It is slightly possible she needs a bit longer of a waketime length, but I would first deal with the disruption issue before trying to change other things. Today is only day two in my baby wise quest and I've got to say I'm having problems trouble shooting. Yesterday went great! But this morning my son (6 weeks) woke up at 4:30 am for a feeding, no big deal, I fed him and then put him back down and in order to keep to my schedule woke him up at 6:30am to feed him and have wake time. he only ate an once, so at 7:30 he ate another 2 onces I tried to put him back down at 8am, which after reading this post, I now think it was a mistake to keep him up so long. Needless to say he would not go back down for his morning nap. I tried letting him CIO and that didn't work, so after some hesitation I went in to comfort him to see if he would calm down and sleep, but again no luck. So finally an hour after I first tried to put him down I got him up and played with him until he ate again at 10am. It was a challenge to keep him up while feeding and then I gave him a bath in a further attempt to keep him up until his next nap cycle. He did go down at 10:40am after some crying. Now I'm torn on what to do if this happens again. Do I wake him up at noon, which is his next scheduled feeding even though it's only been two hours since he last ate? Or do I extend his nap to 12:30pm or 1pm in order to achieve a three hour time period in between feedings? I don't which is right, I am in desperately in need of some guidance. Where did I go wrong, I'm sure it was on several occasions. Thank you. Amber and Alex, It is okay to have some sway. If baby is still sleeping, I would let him sleep an extra 30 minutes, but I don't go beyond that 30. At that point I wake baby up.I think you are doing great and having some bumps is normal at first as you figure things out. Keep waketime length short–figure out his perfect timing. Hang in there! Hello! First, I love the site. I frequent at least once a day for many of my unanswered questions/problems. I do have one. I have seen a lot of posts on daily routine. I have a 5 week old who has been on BW since week 2. His schedule is 7am, 10am, 1pm, 4pm, 7pm (bath included), 10pm and two more feedings in the middle of the night (I let him wake up, which usually is on the 3 hour mark). My questions is, how long should I keep this schedule? I see some keep until 4-6 months. There are times where he will wake up at the 3 hour to feed and there are times when I have to wake. I keep a daily log of everything as well to help keep track. I think I am on the right track. Thanks in advance! I've been doing babywise with my son since two weeks and it's been going pretty good. He's 9 weeks now, but not sleeping through the night yet (he's only 9 1/2 pounds though). However, he's seeming to take more and more wake time and I'm concerned he's not sleeping enough! Of the three hour cycle, he's constantly wanting to stay up 2 hours of it. I've tried different nap times, but he seems to only want to sleep 1 hour of the cycle. However, he's fairly happy and smiley those two hours. But from everything I've read, at his age he should be sleeping almost double that for his naps! Is my son getting enough sleep!? NBCWebster, I keep the three hours going until the baby sleeps from dreamfeed until morning waketime. Sometimes that happens as early as 8 weeks, sometimes 3 months or a bit older. Then I usually drop the dreamfeed (10 PM), then I go to 4 hour schedule. With my youngest, I did the four hour schedule first, then the dreamfeed. SleepHelp! I would say he needs less time awake than two hours at that age. Most babies around his age are up for about an hour–some a bit longer. I should add that he also sleeps with a pacifier and we go back in and put it back in. I think he is waking because he loses the pacifier. I have decided to stop putting the pacifier back in. He will be given it when he is put in his crib but I will not replace it and he will have to CIO. CIO for him means crying for 10 moinutes, I check and talk to him for a few seconds, leave for 15 minutes, go back in, check on him. He has never cried more than 15 mintues total. Usually, he is back asleep within the first 10 mintue interval. My question is still, when should that first nap and 2nd feeding occur each day or better yet, what should a daily schedule look like for a 4-5 month old. My baby is just a week old, but his wake time in the mornings last from feeding to feeding. We've tried everything to get him to sleep and he just stares at us wide awake, not fussy at all. How do I get him to nap? I want to make sure he's getting good sleep wake cycle but this messes up the whole day. Any suggestions? Trying to figure out a schedule for my 3mo and 2.5yo! We can't stay home all morning and wait for the baby to wake up! ha!! This however is her best nap and sets the tone for the day. How long should this nap be?? She is still waking in the early morning–anytime before 6:30 I lay her back down and have to wake at 8:15 or she would sleep until 9! If she wakes at 6:30 I will get her up for the day and she's ready for a nap around 7:30/45. She will sleep for 2+hours if I let her. SO, how long is long enough? She's taking 4 naps a day usually with prob 4ish hours of daytime sleep and a bedtime around 8:30. I would let her take a two hour nap for her first nap. She will go to three naps around 4 months. I would suggest you pick a time of day to official start. When she wakes at 6:30, either start the day, or put her down and wake her at 8:30Or 9 for the day. So many of these comments kill me. Please do not let young babies cry it out. They are crying because they need something. Whether its hunger, discomfort or simply needing love. They are in a big, bright, scary new place. Babies go through many growth spurts in the first 4 months. They should not be on a strict schedule when they are only a few weeks old. There were a few days and nights I nursed my baby constantly. It kept my supply up and regulated to meet his new needs. Those times quickly passed and then he ate more regularly. My baby is 4/12 months and we are on a 3 hour schedule that we are just now working on moving to 4. We couldnt have him up longer or he got overtired and miserable. . I read the comment a about a 4 week old being on the 3 hour schedule?? That's not recommended for such a young age. In the first few weeks they mostly just need to eat and sleep with a little bit of activity. Also it is healthy and normal for babies to wake up several times throughout the night in the first few months.It can be beneficial for your baby to have a schedule as they get older but things happen that disrupt sleep such as growth spurts, reflux, sicknesses and teething. It's our job to adapt and help them with these changes. My baby is 1 month old and this is the hardest nap for us. She gets a full feeding and minimal wake time. I try to look for sleep cues but they aren't really as obvious as during the other naps. She spends most of her time crying and I try to comfort her with a paci and patting her but it doesn't work. After this nap of the rest of the day is a breeze. What would you recommend that I do or change to make this nap more consistent? Start with doing waketime the same as the others of the day. Then work back from there if it doesn't work. Go back by 5 minute increments. Also consider what might be different from that waketime and nap than the other times of day. Is the sun shining right in? Is there a noise keeping her up? Etc. I have a 6 mo old who has been sleeping great through the night since about 3 mo old , for about a month now she is been only taking short naps, 45 min the longest , I have extended waketime and decreased too , I know she's still tired after only a 30 min nap but she won't go back down for so long that even if I let her cry it out she will only take another30 min nap and is still tired…. Her doc who's not a fan of CIO technique even told me to let her cry to teach her boundaries bc she is such a good sleeper but really is so hard ! Any advice ?? Please help! I need at least one two hour nap…. I have a 3 week old, and we seem to be experiencing the opposite of this. She wakes every morning at 7:30, and is next to impossible to put down again until 2 hours later. Her nights are not consistent right now, sometimes she sleeps well only waking every three to four hours, and sometimes she's up every hour after 3am. I am blaming a bad bum rash for her night wings bit this long awake time in the morning is a mystery to me. She is content to snuggle with someone but wide awake. Sometimes she will start to drift off but as soon as we move to put her in her crib she is wide awake again. Any ideas?? First of all your blog – it's incredibly helpful! I have a 10 week old and we've got a pretty decent schedule but I'm having a hard time figuring out the last nap of the day. I cluster feed her in the evening so feed at 3pm,5pm and then 7pm. I have been experimenting by not putting down for a nap after the 5pm feed and then feed her at 7 and put her down for the night however the last feed of the night she is extremely fussy. I breastfeed her for all feeds except the 7pm and 10pm feeds so my husband can get some time in as well. How can the last nap of the day work? Can it be a small one? The book talks about a catnap but not until later. Any help would be appreciated! !